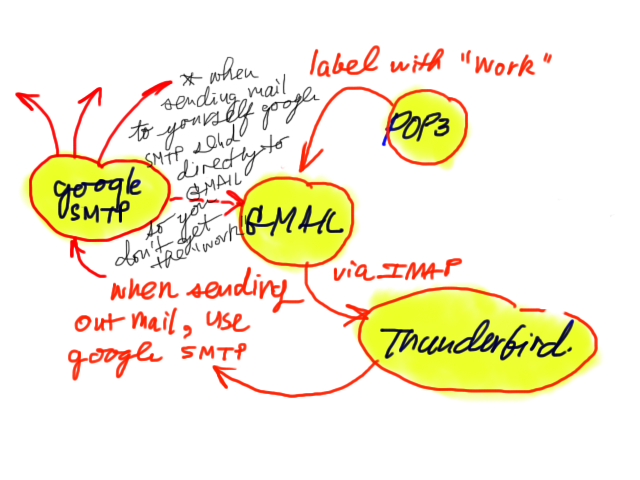 I now use Gmail to get my work mail from POP3 server and serve to my Thunderbird via IMAP. I labeled mail from POP3 as "Work". I can now view gmail and work mail together. IMAP is also convenient as it doesn't matter how many clients you have, they are all synced to GMAIL. You have all your mail in the cloud. When you have to change the PC/Notebook, just install the client and sync. No need to copy .pst file or things like that. One thing I need to get used to is the concept of "Label" which is not the same as "Folders". But I think it has its advantages. Here's how I structured my "label"
You can drag and drop mail to different labels but when you drag mail out from the list, the label used to show that list also get removed, but not other labels. Just have to be aware of this.